Arsenal misfit Mesut Ozil turned into a hero in the second half of Arsenal’s Premier League tie against Watford this afternoon. Arsenal couldn’t manage to create enough clear cut chances in the first half and Ozil was involved in almost every major attacking move for Arsenal in the second half. Arsenal were handed a stroke of luck in the 81st minute when Craig Cathcart turned the ball into his own net giving Arsenal the lead. It took the Gunners only two more minutes to put the game out of Watford’s reach when Ozil finished off a great team move with a cool, calm and collected side foot finish. 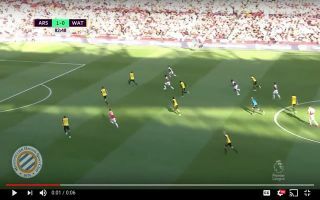 Alexandre Lacazette and Alex Iwobi exchanged passes before Lacazette played the ball across goal where Ozil was free to calmly side foot the ball into the back of the net. Arsenal were amazing in the latter stages of the game and Unai Emery will be hoping that the side can find a way to get out of the blocks much quicker than they did against Watford this afternoon.